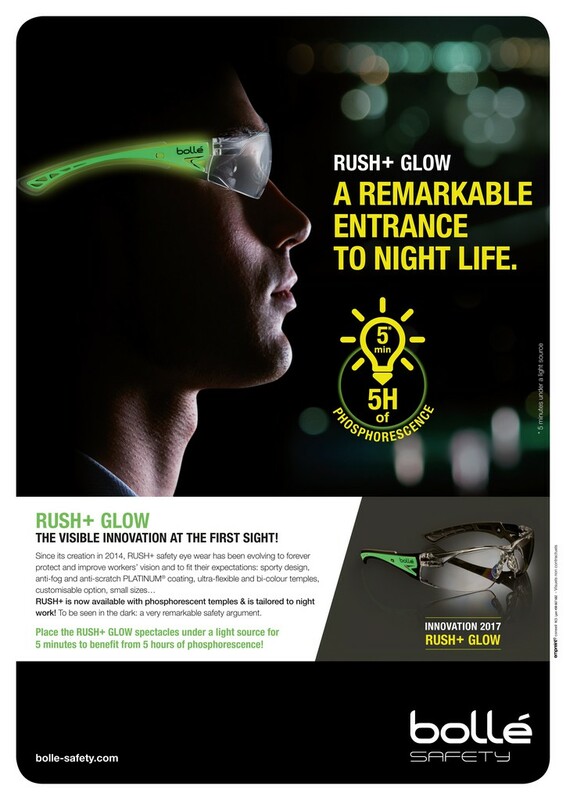 The Rush+ Glow from Bollé Safety is described as the epitome of safety, style, protection and performance. Ultra-enveloping and with Phosphorescent temples, the Rush+ Glow allows the wearer to be seen in the dark. The eyewear comes with 180° panoramic visual field and optical class 1 Platinum double sided anti scratch and anti fog polycarbonate lenses. The Rush+ has a wide range of lens options – clear, smoke, CSP and Twilight and is also available in a small size. Bollé Safety is said to exceed the requirements of all international standards, especially the EN166 K and N option. The new exclusive double sided anti-fog and anti-scratch Platinum coating is now available on Rush+ Glow and is designed to guarantee greater safety, reliability and comfort. This permanent coating on both sides of the lens gives them a high resistance to scratching, to the most aggressive chemicals and delays the onset of fogging.